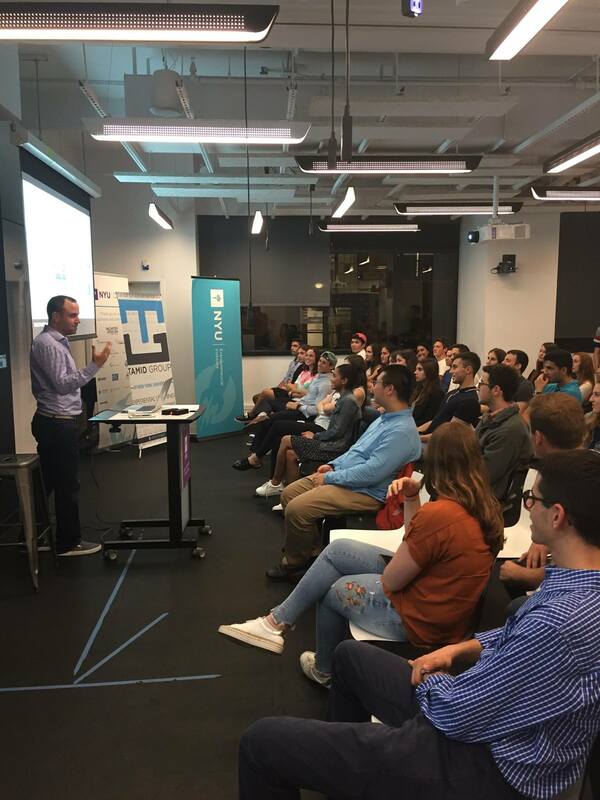 As part of fall semester recruitment, TAMID at NYU hosted an event featuring Guy Franklin, founder of “Israeli Mapped in NY” and the General manager of SOSA NYC. The event was a major success as Guy shared his unique experience as innovator and entrepreneur and attendees got to learn what TAMID is all about. In his talk Guy discussed his website “Israeli Mapped in NY,” an interactive map and platform of the Israeli startups which are operating in NY. “Israeli Mapped in NY” helps connect people looking for jobs in startups to the growing number of Israeli startups calling NYC home. Guy also spoke about his other venture, SOSA NYC, which provides communal office spaces for startups. SOSA further brings together innovators and investors through events and unique business opportunities. After hearing from Guy, TAMID at NYU’s leading members went into further depth about TAMID’s consulting and fund programs. The presentation also featured an overview of the education programming as well as TAMID at NYU’s very own informational video. In addition, attendees learned about the TAMID fellowship as well as the many perks of being a part of the TAMID at NYU community. To close off the event, everyone participated in a startup simulator in which participants tried to improve a real-life NYC startup. Everyone came up with suggestions for how to better market a real-life startup and presented some great ideas in front of the room. After such a special event, TAMID at NYU can’t wait to welcome the Fall 2017 member class!